The pope has already discussed the report with senior Irish clergy. Rome, Italy (CNN) -- The pope has summoned several Irish bishops to the Vatican to discuss a report documenting child abuse by Irish clergy members, the Vatican spokesman said Wednesday. 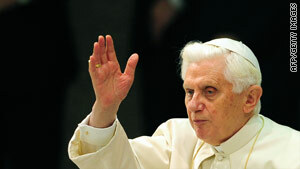 The bishops will meet with Pope Benedict XVI in mid-February, said Father Federico Lombardi, the spokesman. The report, which came out in November, found that the Catholic Church in Ireland covered up "widespread" child abuse from 1975 to 2004. The pope said after that meeting that he was "deeply disturbed and distressed" by the report's findings. He promised that the Catholic Church would try to develop strategies to make sure abuses don't happen again. "He wishes once more to express his profound regret at the actions of some members of the clergy who have betrayed their solemn promises to God, as well as the trust placed in them by the victims and their families, and by society at large," the Vatican said in a statement then. Two Irish bishops -- Jim Moriarty and Donal Murray -- resigned in December amid scrutiny of clergy members committing or covering up child abuse in Ireland. Moriarty had been a priest for 48 years, he said in the statement then. The report did not directly criticize him, but he was a member of the Dublin archdiocese leadership for more than a decade before it put in place proper protections for children, he said. Moriarty said he "should have challenged the prevailing culture" of protecting the church rather than children when he was an auxiliary bishop in Dublin from 1991 to 2002. He apologized to survivors and their families. "I know that any action now on my part does not take away the suffering that people have endured," he said in a written statement. "I hope it honors the truth that the survivors have so bravely uncovered and opens the way to a better future for all concerned." Murray resigned as bishop of Limerick after the report said he failed to report abuse; it did not say he was guilty of abuse. Murray was "aware for many years of complaints and/or suspicions of clerical child sexual abuse in the archdiocese," the report found. It said he dealt "badly" with a number of complaints and suspicions of abuse, and that his failings in at least one instance were "inexcusable." Murray resigned under a canon law that requires bishops who have become unsuited for the fulfillment of their office to resign, the Vatican said. CNN's Hada Messia in Rome, Italy, contributed to this report.